Brazil Looks To Build A 10,000-Mile Virtual Fence : Parallels Brazil's economic growth has brought about more illegal immigration and drug trafficking, so the country is hoping to make its borders more secure. But the experience in the U.S. shows that it can be a difficult undertaking. A drug-sniffing dog checks bags at a Brazilian border crossing with Bolivia on April 3. With an increase in illegal immigration and drug smuggling, Brazil is planning to build a virtual fence along its 10,000-mile border. Brazil's borders are so vast, and the terrain so inhospitable, that attempting to secure them has seemed a virtually impossible task. 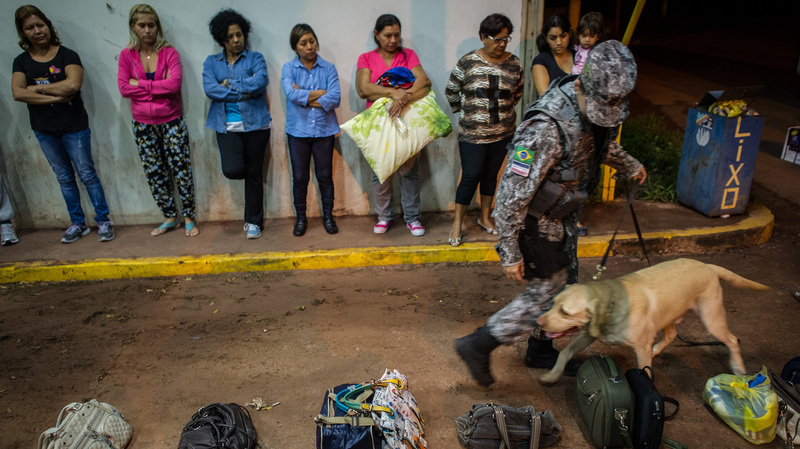 But Brazil's rapidly expanding economy has made the country a magnet for illegal immigration, drug smuggling and other illicit activities, and now the country has announced its own border protection program. Called the Sistema Integrado de Monitoramento de Fronteiras and known by its Portuguese acronym, Sisfron, it is intended to act as a virtual border shield along a frontier that stretches more than 10,000 miles and is shared with 10 other countries. The sheer size of the terrain that will be covered makes this one of the most ambitious defense programs ever put in place in Brazil. Brazil is now picking supplies for the vast project, which is expected to take up to 10 years to finish, according to UPI. Dozens of companies are involved in getting the project up and running; it is expected to cost $13 billion. "There is a lot of illicit transit across the borders," Alberto Pfeifer, a professor at the University of Sao Paulo, said in an interview with NPR. "Brazil does not have control over its territory." The system will use a combination of satellite technology, electromagnetic signaling, tactical communications, drones and an increased army presence to monitor the border areas. This will unfurl in stages. The first pilot project will get underway on the stretch of border with Bolivia and Paraguay. Bolivia is one of the biggest regional producers of cocaine. Paraguay is known as a smuggling haven for many black market goods. But the plan isn't without critics. Brazil's border is about five times longer than the U.S.'s Southern frontier. According to experts, only about 20 percent of the area that Brazil is trying to cover is actually accessible. Most of it lies in thick Amazon forest, marshland, or is traversed by large river systems. The United States' own experiment with a high-tech border system has fared poorly. But supporters in Brazil say the country needs to protect itself and that the ambitious venture is a signal of Brazil's growing power and wealth. "This is the only way to patrol the frontier," said Roberto Godoy, a journalist with newspaper O Estado de S. Paulo. "This is a strategic priority that is long overdue."